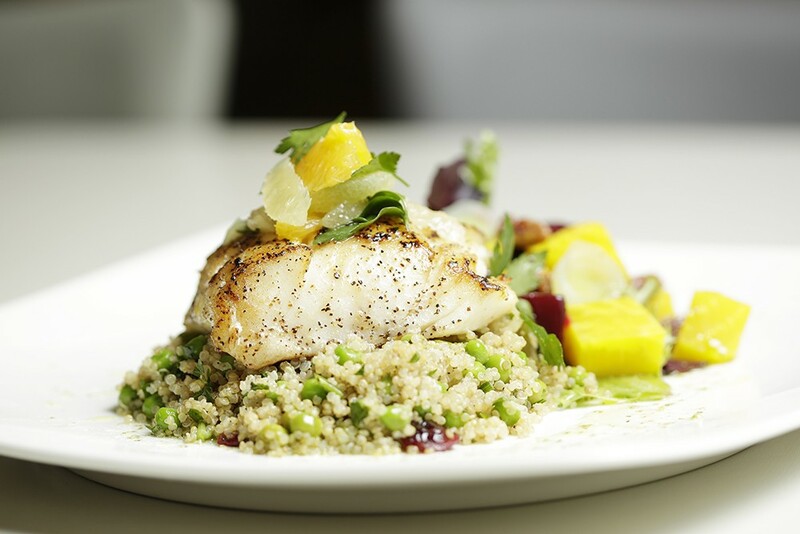 Chef David McCampbell in the Sacred Heart dining room with his grilled halibut: "I want to make the healthy option, the easy option." Chef David McCampbell shares a story from his first month at Providence Sacred Heart Medical Center and Children's Hospital about a woman's special meal request — biscuits and gravy — for her husband, who had less than a day to live. Later, the woman arrived in his office. "When I entered, the woman burst into tears, gave me a hug, and said, 'Thank you. My husband got one of his last wishes.' I felt myself beginning to well up and said, 'You have a big heart, it was the least we could do.'" McCampbell manages the hospital's food production: patient meals, the cafeteria, catering, healthy eating programs and more. "My life," he says, "did not used to be about healthy eating, the healing properties of food, promoting work-life balance or being in service to others, but it is now." 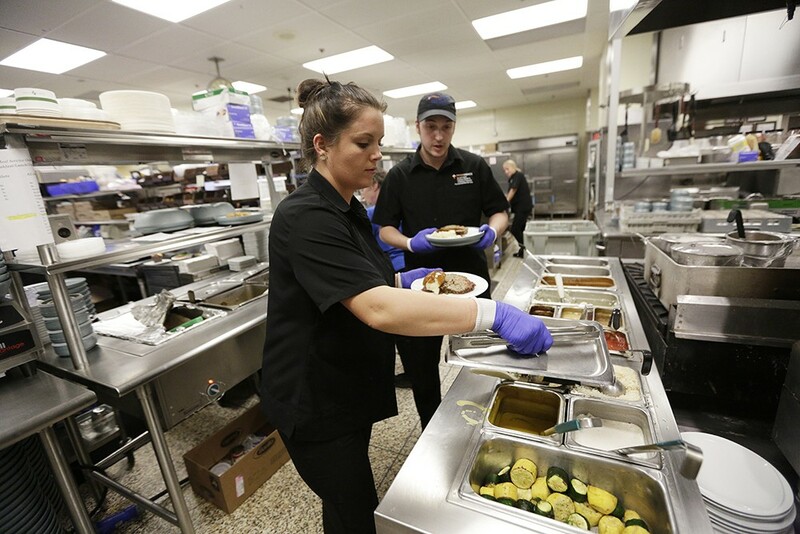 On any given day, for example, Sacred Heart Medical Center's cafeteria feeds upward of 3,200 employees and visitors. On the day we visited, the rotating menu featured scratch-made jambalaya, Middle Eastern orzo salad, Korean ribs and adobo steak wraps. There were vegetarian and vegan options, three kinds of soups, a salad and yogurt bar, and to-go items like baked goods from Transitional Programs for Women's New Leaf Café, a local charity. Also available is something unexpected for a cafeteria: fresh, local produce. 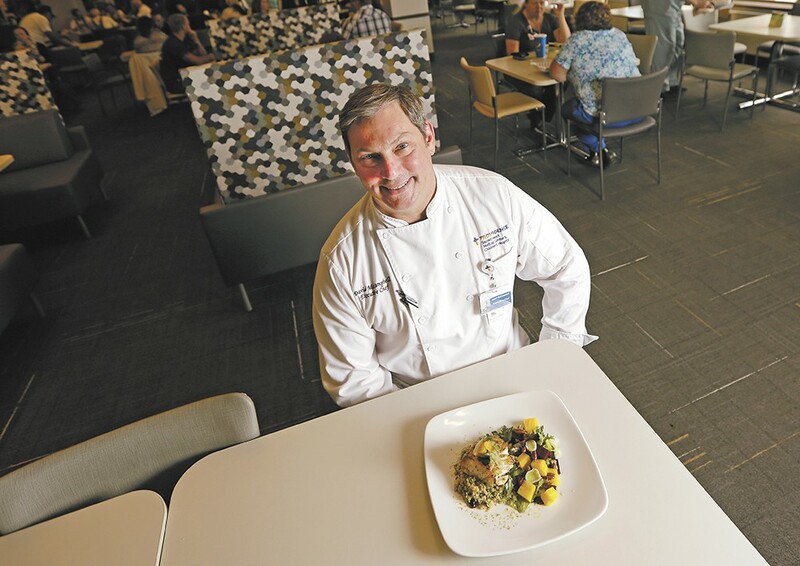 "I want to make the healthy option the easy option," says McCampbell, who prior to Sacred Heart worked at Providence St. Vincent Medical Center in Portland, where the Health & Services Chief Executive, Alex Jackson, championed the "food as medicine" approach. (In 2014, Jackson became CEO of Providence Sacred Heart in Spokane.) McCampbell has also worked in the frenetic restaurant industry, including a stint as executive chef at Portland's upscale Mint/820 and the (now-closed) Lovely Hula Hands, as well as at L'Espalier in Boston. Sarah Rouk and Max Morgan at work in McCampbell's busy kitchen. Local fruit is on offer in the cafeteria whenever possible. McCampbell still concerns himself with flavor profiles, mouthfeel and aesthetics, yet also ponders how a dish can be made flavorful with less fat, sugar and salt, or how he can incorporate a food item's inherent healing properties. That means cooking from scratch, steaming or baking instead of frying, using leaner meats and being creative with spices and fresh herbs. 1) In a small saucepan, combine the quinoa with 2 cups water and bring to a boil. 2) Cover and cook over low heat until all of the water has evaporated and the quinoa is tender (about 15 minutes). 3) Uncover and fluff the quinoa, then transfer to a large bowl and let cool to room temperature. 4) In a separate bowl, combine oil and vinegar and season with salt and pepper. 5) Add the peas, fresh mint, oil and both the juice and zest of one lemon to the quinoa and stir gently. Add pistachios (optional). 6) Season with salt and pepper and refrigerate for 1 hour to let flavors blend. 1) Preheat grill on high heat. 2) Drizzle the halibut filets with olive oil and season with kosher salt and freshly ground black pepper. 3) Oil the grill grates and place the filets on the grill. Gently press the fish down on the grate and cook for 5 minutes on each side, or until the fish is opaque and flakes easily. 4) Mix citrus with parsley and heap on top of grilled halibut just prior to serving.